I just love to add storage - especially in new and unexpected spaces. 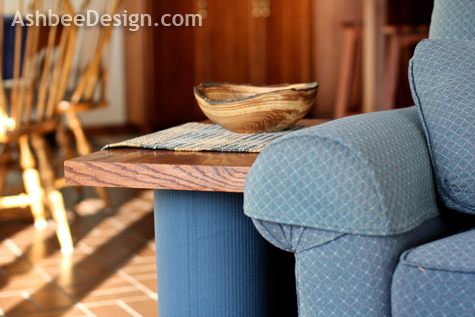 It all started by recognizing we needed end tables for the sofa in the living room. We sit there often in the winter, facing the blazing wood stove, and generally with our computers in our lap. (I know, working from home is tough!). 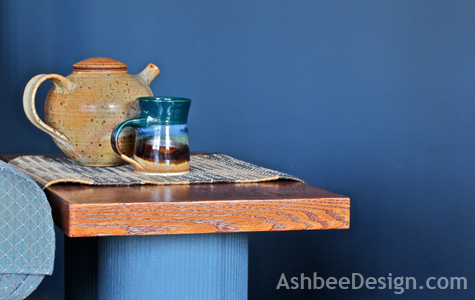 We needed end tables for the cup of tea or coffee! Small in size: Our living space isn't huge and we need to keep walk paths and wood cart paths open. Unique in character: Our home is nothing short of unique. We built it ourselves back in 1978 and there is only one room with all right angles. No glass tops! We are grandparents to a growing group of little ones that come and visit often. All glass tops have been removed for the next 5-8 years. Include storage: Why waste space? I searched in furniture stores, at furniture craft shows, and online. I found nothing. I considered baskets or trunks but sizing was off. So David and I started thinking...... and three weeks later we have two new end tables in our living room! We made them together. Here is the view looking into the living room, with a fire glowing, and the sun shinning (although it is all of 15º F. outside today.) One of the new tables is right there on the end of the sofa. 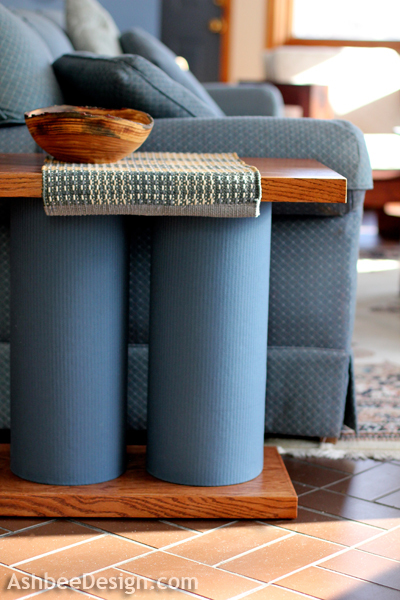 The tables are constructed by combining an oak top and base separated by fabric-covered cylinders. The fabric is leftover from years ago when we had the custom shades made. 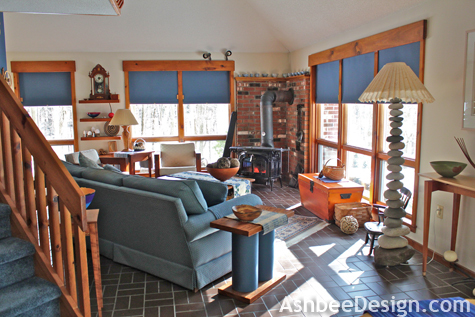 A side note about those shades - Our home is a passive solar design with large windows on the eastern and southern walls. We seal in the heat at night by pulling down those shades which run in custom wood tracks in the window molding. It's a very successful solution! 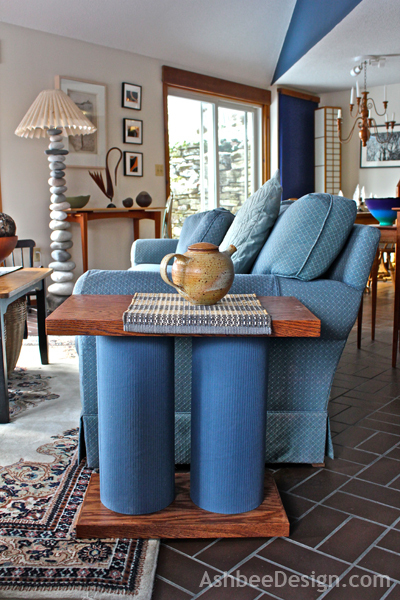 Our living room is filled with warm wood tones, and calm blues, beiges and browns. The effect is natural and cozy. 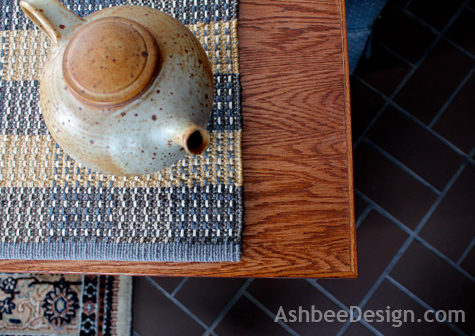 We wanted the end tables to complement the existing décor. We made a matching set of tables that are the perfect height (22") for our sofa and significantly smaller than traditional end tables. Most are 24" x 24" or larger. Ours are 24' x 13" - much narrower. Our house is designed around the great room concept and our living area flows into the dining area, and the kitchen is around the corner behind the stairs. We love living in the open space and it allows for more dramatic space in less square footage. Below is another view back toward the first level master bedroom. 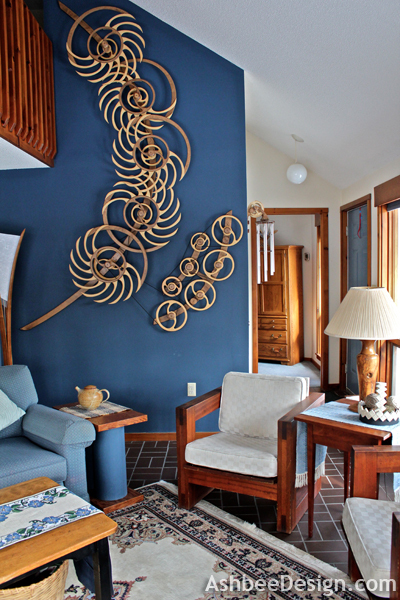 My husband is a kinetic sculptor and the piece on the wall is his incredible work. It is mechanical and does move after winding. You'll note not only our house is unique but also our source of income! If interested, his website is here and there is a video of this sculpture here. 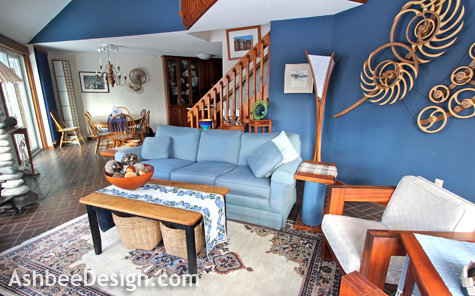 The accent wall is painted Benjamin Moore Van Deusen Blue, a favorite color of mine. But enough about other topics! Back to the end tables. As promised, the tops lift off and the cylinders are designed for storage. 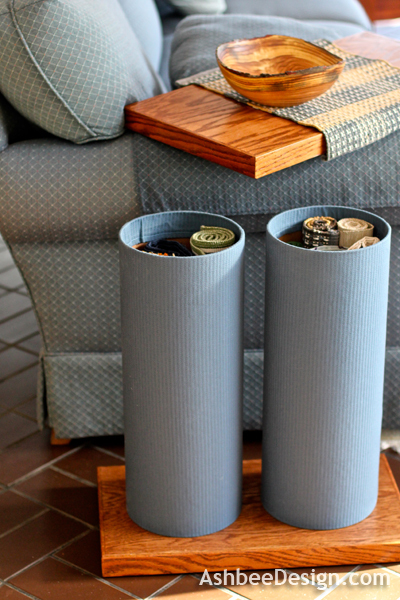 I now keep my growing collection of table runners rolled up and stored in these cylinders. The underside of the cover has circles that fit right into the cylinders. And the tops are perfect for tea! 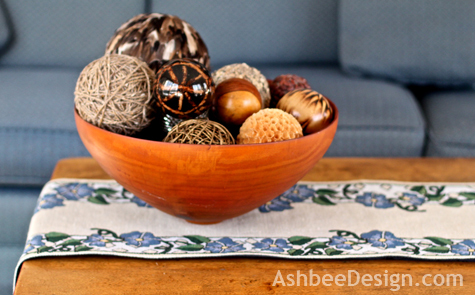 In my next post I'll share some of the DIY secrets and steps. Update: Tutorial is posted here. And here is an apology - I had some very unusual technical difficulties in getting this post online this morning. If you subscribe by email, you probably got 3 or 4 messages as I ended up re-doing the post twice because of oddities in the code. Putting those Pinterest things in are giving me gray hair! I apologize for the multiple postings which I expect resulted in multiple e-mails! I'll try to do better tomorrow. How clever and creative to find a perfect solution. The sculpture is fabulous. What a cool idea. Very unique. I am hosting a link party and would love it if you would check it out. So clever! I love the storage solution. What a beautiful open living area too! So ingenious!! 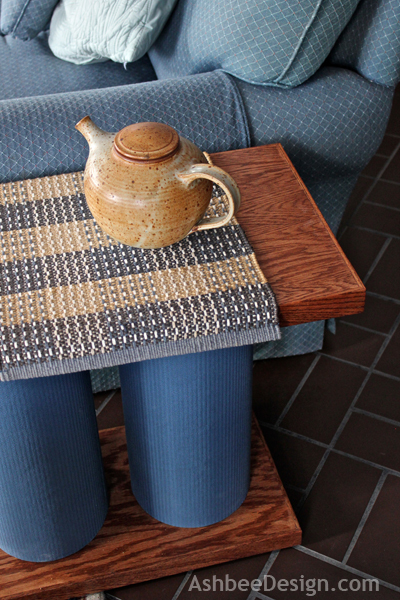 I love these tables - beautiful and effective. Thanks for linking up at Romance on a dime!